On Sunday morning, I preached a sermon on 2 Corinthians 4, in which I struggled to find a modern metaphor for clay jars, Paul’s metaphor for the wild inappropriateness of our weak, fragile broken bodies as vessels for the gospel. On Monday, July 4, 2016, America celebrated its independence day. On Tuesday, two police officers fatally shot Alton B. Sterling in Baton Rouge, Louisiana. On Wednesday evening, a police officer fatally shot Philando Castile during a traffic stop in Falcon Heights, Minnesota. Last night, five police officers were killed by snipers during an otherwise peaceful protest held in downtown Dallas. This morning, practically paralyzed by the events of this week, grief stricken and broken hearted, I wrote this lament to our gun-spangled America. 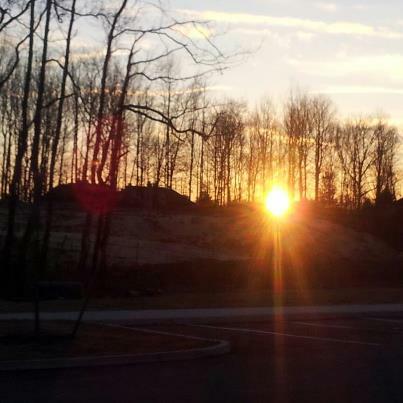 I woke up this morning, and like so many wondered naively, will things be different? Will things be different on a morning where birds chirp, where it seems possible to be hopeful, the heavy, oppressive heat yet to descend upon us? Who are you, this shadowy America, and what have you done with the free and the brave? How heavy your burden of history and violence and oppression, how heavy the present fear and death you inflict upon black men and black women, America. How heavy that fear descends upon law enforcement, for even their guns will not free them from this madness! And it seems we have no choice–to put down our guns is surrender, but to leave them raised is death. We have all become perpetrators. We have all become victims. And so I scoffed bitterly, I want no part in your gun-spangled America, in the weapons you wave that display not freedom or strength but cowardice and fear! These guns, these guns are illusions, nay, allusions to protect, to intimidate the very fight out of war, yet with each gunshot we’ve slowly come to the realization that America is at war with itself. That what seems unfathomable because of our modernity, our civilization, has come not in spite but because of it. We fail to accept our common mortality, our common humanity, and so we wage war upon our brothers and sisters in a paradoxical desire to protect our own. But we live with death at work within us (2 Cor 4:12), so painfully and palpably now, we are bearers of not only the body of the death of Jesus martyred by the state (2 Cor 4:10), but 566 people killed by the U.S. police in 2016, 53 American officers killed in the line of duty in 2016, and now overall 7088 gun related deaths in the U.S. in 2016. Scripture tells us that we carry that death so that the life of Jesus may be made visible in our mortal flesh (2 Cor 4:11), but with death among us and America’s shadows, I worry that the resurrection is only for another world. We find hope in resurrection because it’s a respite from our self-inflicted madness; our world crowds out light and peace and resurrection–our gun-spangled America–and I want no part in that. And yet, I must wake to this world, because my own blood-stained hands have helped form it. I must be one to put down my gun–not just a literal gun–but my very real fears and prejudices and selfishness and insults and division that I had once thought might keep me safe. I must be one to carry death inside, but to also live with defiance when life itself has been marred. I must be one to show my face, to preach the kingdom of God in this inconvenient moment and in this wounded nation. I must be one to cry out for the fragility and the brokenness of our human condition, but also the deep meaning in lives lost, to cleave to something beyond the madness–so that gun-spangled madness won’t be what life in America is all about. Who are we, shadowy America, and what have we done with the free and the brave? Who are we, both perpetrators and victims of madness? Who are we, children of God? No matter who we are, no matter where we’ve come from, or what we’ve done, there are times in this life where we are reminded that we are but fragile humans, vulnerable to the myriad of threats to life on this planet. And at times like these, we ask very important, very human questions about whether a good and mighty God causes or allows things like disaster, disease, or illness. We asked some of these questions last Sunday as part of a summer series our pastor is engaging on questions from the congregation. As she invited members of the congregation to share, it became apparent that we’re all struggling somehow–that these threats to life touch us all very deeply, because none of us, no matter how proficient at this thing called life, is immune to disease, disaster, or especially, death. 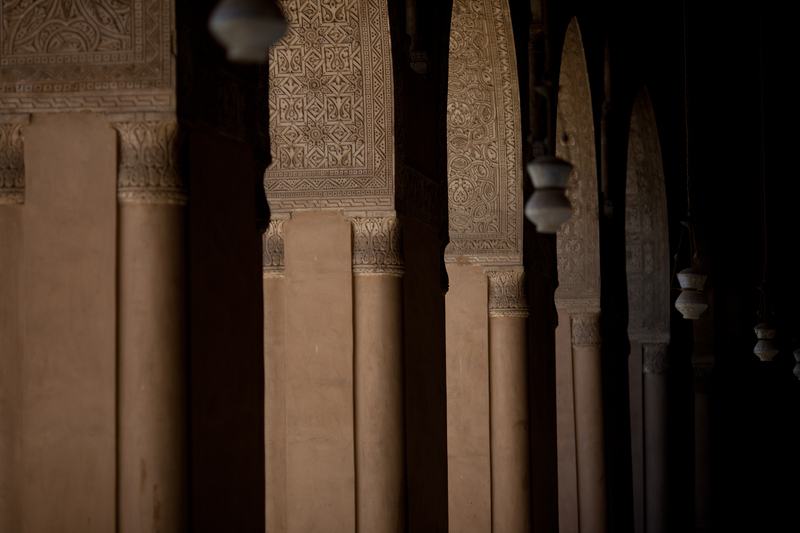 A mosque in Cairo, Egypt. Photo by Ben Robinson. And as our wise pastor shared her own thoughts on this difficult topic, looking out at many tear-stained faces in the congregation, she pointed us from God’s Old Testament miracles to Jesus’s healings, to his death on a cross, and finally, his resurrection and the Holy Spirit he left behind. She reminded us, as she often does, that we are the body of Christ, and so we’re the ones that are charged with ministering to one another, with being Christ to one another in these moments where the questions seem to weighty to bear. So I’ve been pondering, all week, the depth and simplicity of that theology, daring to wonder what life would be like if we were one another’s comfort, one another’s grace, each other’s miracles? They would know we are Christians not by our love, but by our empathy, by our grace, and our mercy. Because love is oft contaminated by the things of this world, sometimes most of all by we Christians and our misguided, self-righteous and judgmental interpretations of truth. 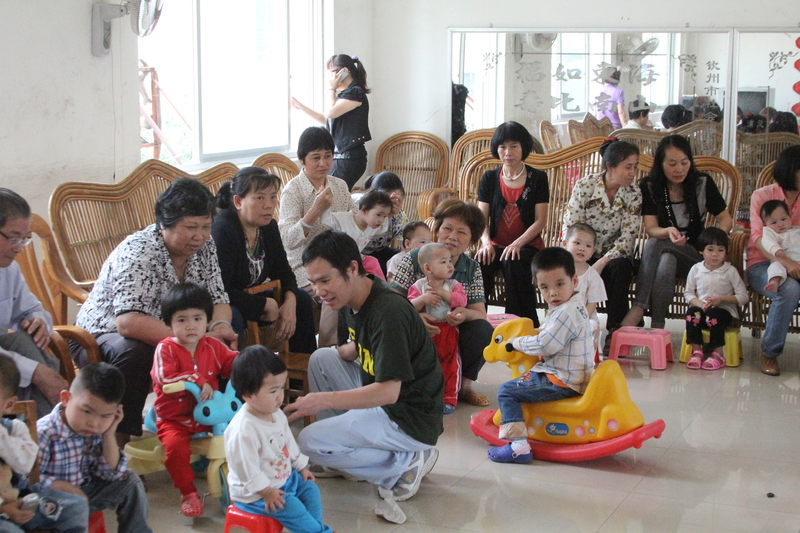 Foster families in Qinzhou, Guangxi. Photo by Jason Fouts. I’m led this week and this weekend to contemplate an economy of grace in which we can be a little more aware of how much we’re all hurting and a little less judgmental and a lot more humble about how healing happens. What if instead of contemplating the origins of disease, asking how the bus driver got lung cancer, or quibbling with the details of disaster, wondering why people bother to live in Oklahoma which is so prone to tornados, we contemplated the length that Christ went for us on the cross, the underservedness of our own grace, and the abundance of grace in a world that’s often so graceless? And then what if we committed to being not the one who speaks, but the one who prays, not the one who solves or fixes or even heals, but the one who recognizes, beholds, and reveres deep need? What if we found a way to acknowledge great hurt, but live with great hope? What if we were one another’s comfort, one another’s grace, each other’s miracles? 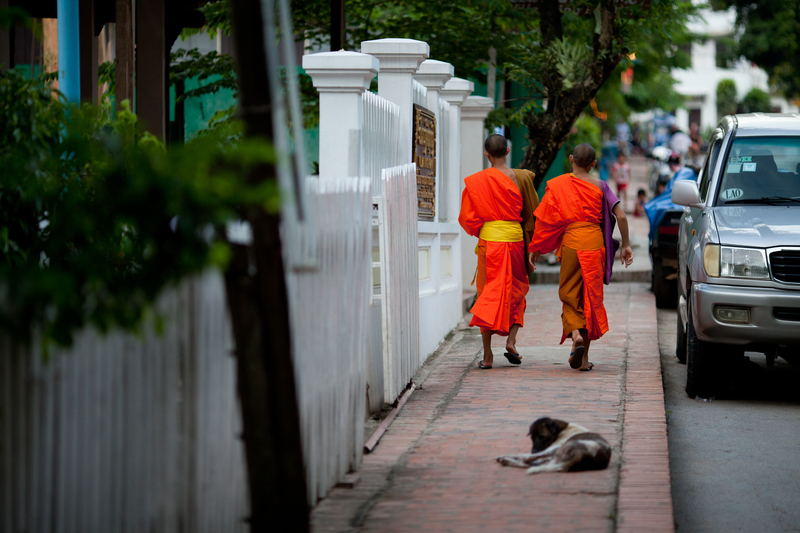 Young monks in Luang Prabang, Laos. Photo by Ben Robinson. It’s just a few days prior to his death, and he knows it’s coming along with betrayal by those closest to him, mockery, and agony. And yet he ties a towel around his waist, fills a basin with water, and stoops close to the ground and the filth and the earth to wash the disciples’ feet. If that doesn’t fill you with awe, I don’t know what will. 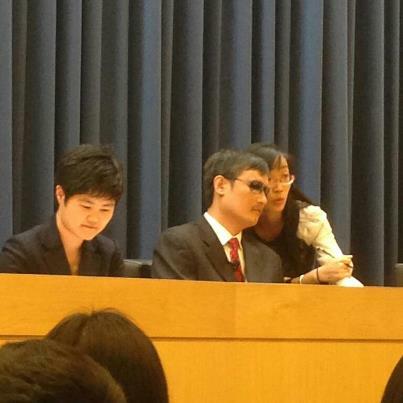 My Chinese teacher translating for Chen Guangcheng at Princeton University yesterday afternoon. Last night my husband and I went to hear blind human rights activist, Chen Guangcheng, speak on the Princeton University campus. He told his story of working for justice in China, his famous escape to the U.S. embassy, the lesser told tale of his family’s continued persecution, and the gory details of his nephew’s beating and imprisonment following his asylum in the United States. While the reality of human rights abuses in China is rife with suffering, fear, and pain, Mr. Chen’s family, other activists in China, and many around the world haven’t given up. 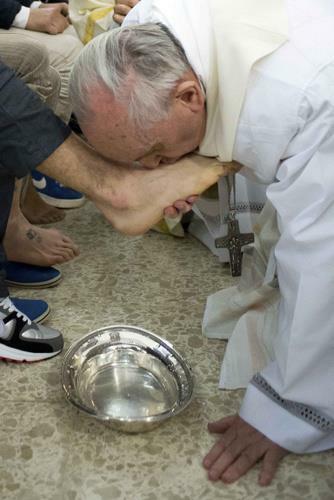 Pope Francis kissing inmates’ feet. When you really think about it Holy Week, so artfully named, was “beyond bad.” There was really nothing good about good Friday, and there is nothing more nightmarish than the death of God. But even in death God hasn’t met Her match. Sometimes we forget, though, that it came to that–that death was gory for Jesus, that it was pain, and the earth plunged into darkness–that simply put, we can’t have the resurrection, the wow, the shoots of grass, without the “beyond bad,” the nightmare of the crucifixion that delivers us from sin and death. And with all that was yet to come, he went willingly to his death. Yet, before doing so he took their feet in his holy hands and scrubbed them like a servant. That’s what our savior did with some of his last moments on this earth. Easter is generally quite quiet and unassuming in China. I’ll be up on Easter morning, right around sunrise, getting into a taxi to head to the airport to travel to several provinces and visit foster care projects. Often the rhythm of my life here in China couldn’t be more different from my previous experiences helping to pastor during the bustle of Holy Week, and I’m left to wonder what Easter means in a foreign land. But then again, that early morning was no doubt a strange, foreign experience for Mary Magdalene, Mary the mother of James, and Salome as they ventured out in the early sunlight to anoint their messiah. For some reason as my friend and I read through this scripture the other morning, my mind was drawn to their preoccupations over, “Who will roll away the stone for us from the entrance to the tomb?” I think about how they must have felt, powerless and hopeless as they walked to the tomb, knowing not even how to move the stone when they arrived. 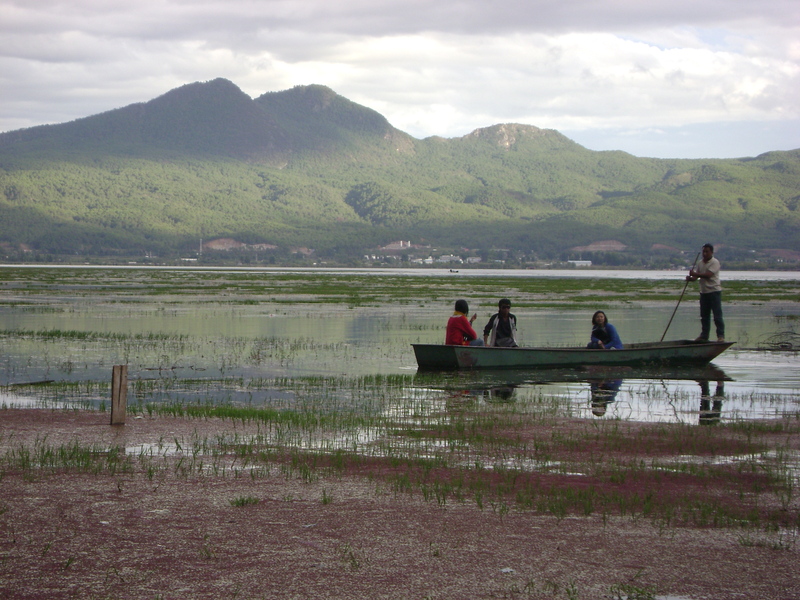 A week or so ago when we traveled into the countryside to visit foster families, a friend of mine and I got to talking about what we do in America versus what they do in China when someone dies. It was difficult to explain to her the sterilized world of funeral parlors, embalming, and even cremation. “I was the one who helped prepare and clean my grandmother’s body before she was buried,” she stammered. Chinese people are particularly fearful of the dead and of evil spirits, but it perplexed my friend that anyone other than the family would attend to such an intimate practice as preparing a loved one for life in the spirit world. “I wasn’t afraid, I didn’t even cry,” she remarked proudly. I think about how the women, despite their own fears and misgivings, not even knowing how to move the stone, went to the tomb anyway. And I think of how when they arrived the angel told them plainly that their Jesus has been raised, and was going before them to Galilee. And I think of how difficult it really is to trust that God is going ahead of us. A woman honors her ancestors during the tomb sweeping festival in China. Photo from The Telegraph. Another one of my friends talked through her tears earlier this week about tomb sweeping traditions in China where one prays to the ancestors and conflicts between these and her Christian faith. Many extreme voices from the Christian foreign and local communities, not unlike those centuries before them, stress that believers today need to take a stand against these traditions and their families, and refuse to participate. But my friend, in her deep faith and wisdom, knows there must be another way. So she will make the trip home today to her family, to sweep the graves and honor her ancestors and her very much living family, and carry the promise of the resurrection in her heart. And rather than risking that the promise of grace become confused with rejection, anger, and bitterness, she will wait and pray, and when the time is right, she will share the way in which her faith makes her life full and complete and meaningful with her loved ones. I pray that she will trust that God is indeed going before her this weekend. It seems to me that not just my friend or Chinese Christians or the women who brought spices, but all of us wonder and worry who will roll the stone away from the tomb for us. We all struggle to trust that God has truly gone ahead of us and died for us and been raised, and that no mistake on our part, not even the terror or the muteness that supposedly plagued the women that fateful morning can change that. The promise has been–and is fulfilled, in the resurrection of our Lord. That is why we proclaim, Jesus is risen, He is risen indeed, from wherever we find ourselves this Sunday, from the tombs of the Chinese countryside to the sanctuaries of the United States. And we give thanks that God has done what God promised, and that we, the weak, afraid, mute, and hopeless, are the recipients of such grace that flowed out from that empty tomb on a quiet morning in another land years ago. P.s. If you’re looking for more Easter reflection, Rachel Held Evans is doing a wonderful series on Women of the Passion on her blog.